Appko : is a Application HTML5 Template. It can be used to promote your services, It has some features which will help you make your project stand out from the crowd. It has been optimized to facilitate your time and money. It is well documented which will help you to get your site running easy and fast. You can customize it very easy to fit your business needs. If you like my template, please rate it 5 stars. It’s very useful for me. We hope you like it! 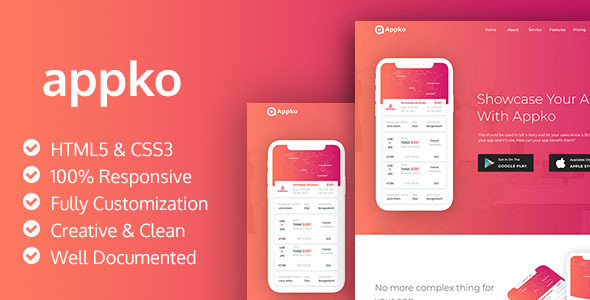 Appko is Clean and Modern Responsive App Landing page template. It is Responsive HTML5/CSS3 Template based on Bootstrap 3. It works nicely on all smart devices: smartphones, tablet, PCs, and desktops. The template includes built-in Less support, which helps to change the color easily. All files are clearly organized we believe it will be easy to use and edit them. Anyone can customize this template as his wishes. Suitable for anyone who is looking for app, app landing, app landing page, app landing template, App Showcase, app store, app template, app website, clean app landing, creative app landing page, landing page, mobile app landing page, modern app Landing, Simple App Landing Templates. If you need any help using the file or need special customizing please feel free to contact me via my Themeforest profile. If you have a moment, please rate this item, I’ll appreciate it very much!.... Thank you. Note: All photos are for preview only and are not included in the downloaded files.